I can't resist from saying so, but are you still living in your own safe bubble world? Hello Kitty fans-- meet the rest of the world (outside of Asia)! Say hello. Before reading the article below, please do keep in mind that this author is not a hater or a "detractor" of Hello Kitty. Just a normal average reaction of someone who sees Hello Kitty for little girls. Stereotypical since there are adult fans of Hello Kitty, but what can you really do? That's life. Roll with it or get left behind for throwing a tantrum because the world doesn't revolve around you and your interests. 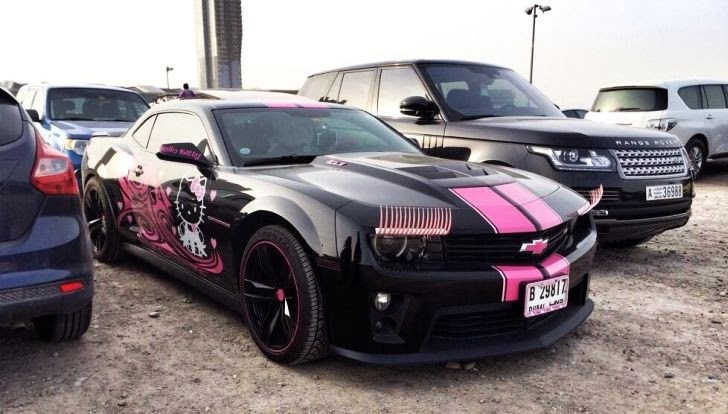 Below is a very cool looking Camaro car, all decked out in Hello Kitty. For some people, it may be ugly to them, but to us, fanatics, we love it! And, especially, for someone like me, who is very picky. I'm thinking the reason I like the whole overall appearance is because the car has a simple design with Hello Kitty attached to it. It's not too much Hello Kitty, where some owners just plaster Hello Kitty art all over the car. The design below didn't go overboard. It's pleasing to the eye. Look at the Interior customization inside-- that door! I want mine with HK pattern prints. Read the two articles at Auto Evolution or continue below. The second article is a follow up. While a Hello Kitty theme might be appropriate for a Mitsubishi Mirage, we can't really understand why some people would use the Japanese character to pink up a musclecar. Don't get us wrong, we ain't got nothing against Moulin Rouge or Panther Pink Mopars, but Hello Kitty Camaros are just plain wrong. Yes, we said Camaros, which means there's another one besides the eye-stabbing ReStyleIt version we saw last year. We don't know the story behind this one, but the plate suggests it's from Dubai. Which is a bit surprising to be honest, as we'd rather expect to see some gold-plated Camaros over there. Anyway, this black GM-built musclecar got a pair of pink stripes across its hood and top, Hello Kitty writing on the side mirrors and huge Hello Kitty-themed decals on its doors. To complete the car's feminine looks, the owner also opted for a pink bowtie badge on the front grille and a couple of pink eyelashes above the headlamps. Yuck! A few days ago, just before the Detroit Auto Show was about to start, we received a photo via twitter of a black Camaro ZL1 with pink Hello Kitty accents. Naturally, we jumped at the chance to say it's a bit of a misfit, an oddity that should never exist. 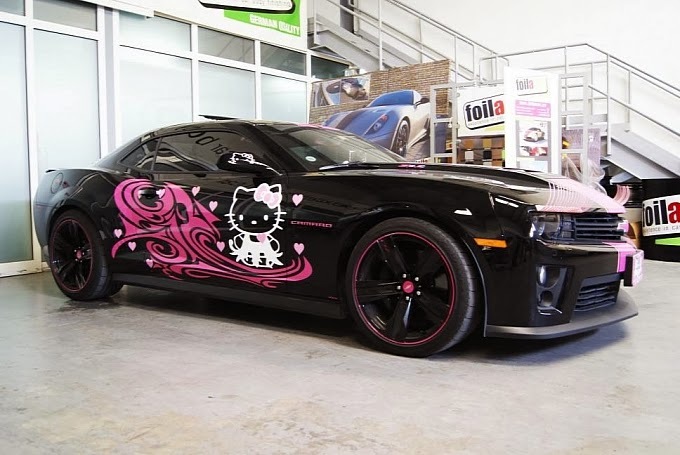 But the owner of the car reached out to us a few days later, saying "Don't let it ruin your day, my day begins when I start my awesome ZL1 HELLO KITTY CAMARO, All you will see is the dust I leave behind. Get a life, I have one and it's great." Our curiosity was instantly sparked by this and we reached out to the owner to find out more. After all, even if some people might not like it, the ZL1 is bringing its owner joy and that's what matters. Yolanda is originally from South Africa but moved to Dubai. She says people there are much more civilized and kind. She even goes as far as to say that it's a privilege for her six kids to live the UAE. So what about the car? Yolanda's photos show it was wrapped at a company called foila and even has four Hello Kitty exhaust tips. Yes, they do make those in Japan. 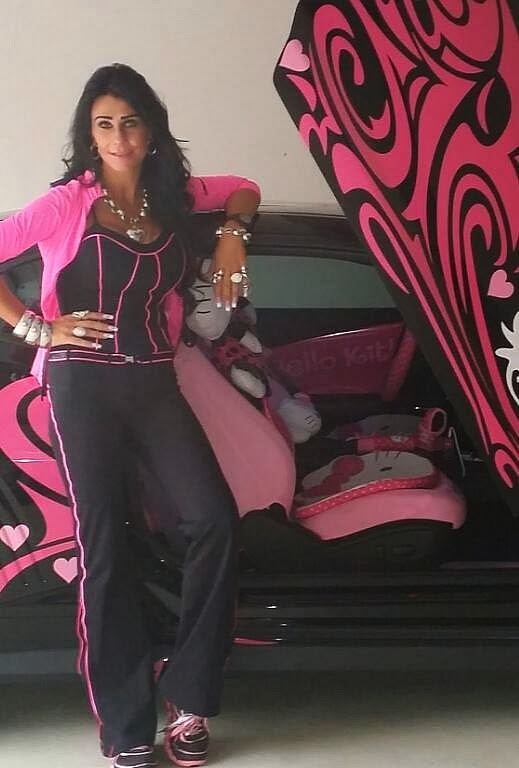 Behind the custom scissor doors, there's pink seat covers and Hello Kitty pillows. Even the steering wheel, shifter and door cards have been customized. This really is a Camaro like no other and Yolanda says not a day goes by without people taking photos or asking her about it.